Crude glycerol is a main by-product from biodiesel production, and efficient utilization of crude glycerol will bring significant economic and environmental benefits. However, the complex compositions of crude glycerol may impair the cellular growth and inhibit the crude glycerol consumption. Therefore, it is necessary to find a simple method to treat the crude glycerol and release the inhibition on cell metabolism. The simply purified crude glycerol by activated carbon can be used as the carbon source to produce succinate in two-stage fermentation by the engineered Escherichia coli strain, MLB (ldhA−, pflB−) expressing phosphoenolpyruvate carboxykinase. In the flask experiments, succinate production from crude glycerol without treatment was less than that from pure glycerol. However, in the experiments of 1.5-L bioreactor, little succinate was produced in crude glycerol. The simply purified crude glycerol was used as carbon source for succinate production, and the glycerol consumption and succinate production were enhanced greatly. The succinate produced from the simply purified crude glycerol reached 566.0 mM, which was about ten times higher as that of non-purified one (50.3 mM). The succinate yield of the anaerobic stage achieved 0.97 mol/mol, which was 97% of the theoretical yield. The treatment of crude glycerol by activated carbon could effectively release the inhibition on the glycerol consumption and succinate production of the engineered E. coli strains, so that the fermentation result of the treated crude glycerol was similar as the pure glycerol. The results showed that the metabolically engineered E. coli strains have great potential to produce succinate from crude glycerol. Biodiesel is renewable and environmental-friendly, and it is an ideal substitute for petroleum diesel. It was postulated that the world biodiesel market would reach 37 billon gallons by 2016 (Anand and Saxena 2011). Crude glycerol is the main by-product of biodiesel, and it will generate about 10% (w/w) glycerol in the process of biodiesel production (Vivek et al. 2017). With the significant increase of biodiesel production, the price of crude glycerol decreased dramatically. Glycerol has higher reduced state comparing to sugars; in addition, the amount of cheap crude glycerol is abundant. Therefore, a series of sustainable processes were developed to convert glycerol to higher value products. Varieties of chemicals, such as 1,3-propanediol, citric acid, hydrogen, poly (hydroxyalkanoates), lipids, succinic acid, etc., can be produced from crude glycerol via biological conversions (Li et al. 2016, 2017b; Wu et al. 2014; Vivek et al. 2017; Yang et al. 2012). The composition of crude glycerol is significantly different from pure glycerol, and it contains various impurities, such as methanol, fatty acids, fatty acid methyl esters, soap, etc. The refining process of crude glycerol to pure glycerol generally consists of three stages, including neutralization/separation, vacuum evaporation, and deep refining (Luo et al. 2016). Therefore, crude glycerol as carbon source to produce value-added chemicals can further reduce the cost. However, methanol and other compositions in crude glycerol may be harmful for cell growth and fermentation, and then, the crude glycerol are needed to be simply purified before adding into the fermentation medium. Activated carbon adsorption is a common method for crude glycerol purification and easy to operate, and it is efficient to reduce color and adsorb small molecular compounds and some fatty acids (Manosak et al. 2011; Luo et al. 2016). Succinate, a C4 dicarboxylic acid, is an intermediate of the tricarboxylic acid cycle and plays very important roles in cell metabolism. Meanwhile, it is also one of the top 12 platform chemicals from biomass (Werpy and Petersen 2004) and widely used in the production of foods, agricultural, pharmaceuticals, and biodegradable plastics (Zeikus et al. 1999). Succinate producing microorganisms and fermentation strategies are developed to reduce or even finally replace petroleum-based succinate production. Natural succinate production bacteria, including Anaerobiospirillum succiniciproducens (Bretz 2015), Actinobacillus succinogenes (Carvalho et al. 2016; Zou et al. 2011), and Mannheimia succiniciproducens (Lee et al. 2016; Ahn et al. 2017), and non-native strains, such as Escherichia coli (Chen et al. 2014; Meng et al. 2016; Jian et al. 2016; Li et al. 2017b) and Corynebacterium glutamicum (Okino et al. 2008; Chung et al. 2017) have been studied for succinate production. Escherichia coli, a facultative organism, is able to grow under anaerobic condition and performs a mixed-acid fermentation (Clark 1989). Deletion of competing metabolic by-product pathways and overexpression of enzymes related to succinate production were widely used to increase succinate production (Balzer et al. 2013; Chen et al. 2014; Gonzalez et al. 2008; Thakker et al. 2013; Jiang et al. 2014; Li et al. 2017a; Meng et al. 2016). Lab evolution strategies also enhanced the ability of succinate production in Escherichia coli by affecting the energy-conserving pathways and reducing equivalent-conserving pathways (Zhang et al. 2009; Zhu et al. 2014). Since glycerol has the higher reduced state than glucose, it was long thought that E. coli could not utilize glycerol under anaerobic conditions without external electron (Lin 1976; Booth 2005). In recent years, researchers were focused on the glycerol metabolism of E. coli under micro-aerobic or anaerobic conditions (Dharmadi et al. 2006; Gonzalez et al. 2008; Mienda et al. 2016; Li et al. 2016; Zhang et al. 2010). Conversion of 1 mol glycerol to phosphoenolpyruvate (PEP) will generate 2 mol of NADH which is equal to the requirement of reducing equivalents for the formation of 1 mol succinate. CO2 can be fixed during the production of succinate from glycerol. 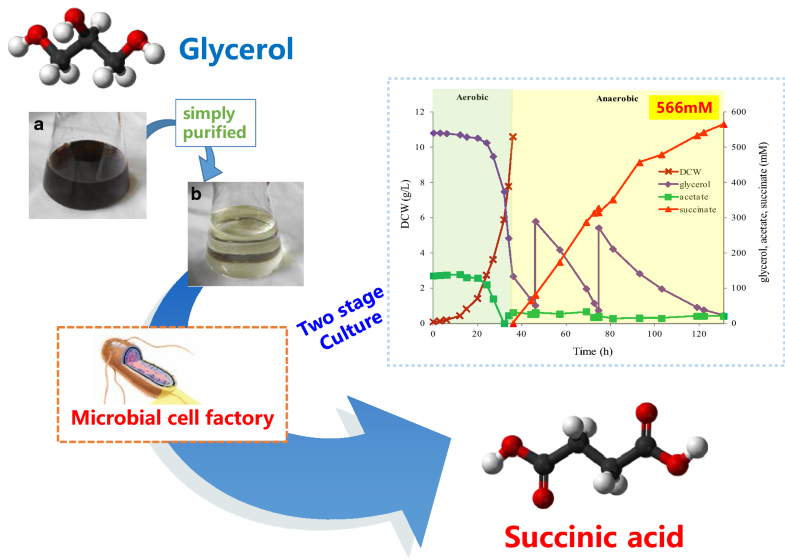 To produce succinate from glycerol, different strategies of fermentation based on different engineered strains were applied, such as anaerobic (Zhang et al. 2010), micro-aerobic (Blankschien et al. 2010) and aerobic (Li et al. 2013) cultures. Sadhukhan et al. (2016) treated the crude glycerol through several physical–chemical steps: acidification, neutralization, solvent extraction, adsorption, and, finally, pressure filtration through a membrane. Then, the treated glycerol was used as carbon source to produce succinic acid by E. coli (ATCC 8739), but only 1.4 g/L succinic acid was accumulated. In our previous studies, two-stage fermentation strategy was applied for succinate production from glycerol, which contains aerobic cell growth stage and anaerobic conditions for succinate production stage (Li et al. 2016). In the growth stage, high cell density can be acquired and different aerobic cultivation strategies can regulate the enzymes activities which involve succinate production. Meanwhile, the activities of the aerobically induced enzymes can be maintained for succinate biosynthesis during the anaerobic phase (Jiang et al. 2010; Wu et al. 2007). Culture-condition regulation strategies were also used in two-stage fermentation process, and high final titer and yield were achieved (Li et al. 2017b; Zhu et al. 2011). In this study, crude glycerol, which was simply purified by activated carbon, was used as carbon source for succinate production by MLB/pTrc99a-pck. This simple purification could increase the succinate biosynthesis from the crude glycerol significantly, and the titer and yield of succinate were similar as that of using pure glycerol as carbon source. Double mutants E. coli strain MLB (ldhA−, pflB−) and the plasmid pTrc99a-pck (over-expressing pck from MG1655) were constructed in our previous study (Li et al. 2016). The strain of MLB/pTrc99a-pck was used in this study. Luria–Bertani broth (LB, per liter: tryptone 10 g, yeast extract 5 g, and sodium chloride 10 g) was used to culture the primary inoculum of MLB/pTrc99a-pck at 37 °C. Ampicillin was added with a final concentration of 100 mg/L. The salt medium (SM) was used for secondary preculture after adding different kinds of glycerol as carbon sources and its components contained (per liter): Na2HPO4·12H2O 15.12 g, KH2PO4 3.0 g, NaCl 0.5 g, MgSO4·7H2O 0.5 g, CaCl2 0.011 g, NH4Cl 1.0 g, 1% (w/v) vitamin B1 0.2 mL, and trace elements solution 0.1 mL. The trace elements solution contained (per liter): FeSO4·7H2O 80 g, AlCl3·6H2O 10 g, ZnSO4·7H2O 2.0 g, CuCl2·2H2O 1.0 g, NaMoO4·2H2O 2.0 g, MnSO4·H2O 10 g, CoCl2 4.0 g, and H3BO4 0.5 g.
Media of GASM, CASM, and SASM were prepared by supplementing SM with pure glycerol, crude glycerol (Qianglin Bio-energy Material Co., Ltd., Liyang, Jiangsu 213364, China) and simply purified crude glycerol as carbon source, respectively. During aerobic growth stage in flasks, the glycerol concentration was 3 g/L in these media. In addition, 2 g/L sodium acetate (final concentration) was also added into GASM, CASM, and SASM as co-substrate of glycerol. The media for anaerobic fermentation in flasks were NH4Cl-free SM supplemented with pure glycerol, crude glycerol, or simply purified crude glycerol. The concentration of glycerol and basic magnesium carbonate in the anaerobic fermentation media was 15 g/L and 20 g/L, respectively. The media of fermentation, which was carried out in a 1.5-L bioreactor (BIOTECH-1.5; Baoxing Co., Shanghai, China), were modified SM supplemented with pure glycerol, or crude glycerol, or simply purified crude glycerol (the initial concentration of glycerol reached 50 g/L) and 10 g/L of ammonium acetate. The concentrations of Na2HPO4·12H2O, KH2PO4, and NH4Cl were changed to 3.78, 0.75, and 10 g/L, respectively (Wu et al. 2012). Ampicillin was also added into the media at the concentration of 100 mg/L. 1 mL of stock culture was transferred to 30 mL LB medium in a 250-mL flask to prepare the primary preculture. The cells were aerobically incubated at 37 °C and 220 rpm for 8 h. In the aerobic stage carried out in 500-mL flasks, 2-mL aliquots of the primary preculture were transferred to 100 mL GASM, CASM, or SASM, and the cells were incubated at 37 °C and 220 rpm for 8 h. Then, 0.1 mM of IPTG was added to induce the overexpression of pck. After 4 h of induction, centrifugation was carried out at 4 °C and 6300×g for 5 min to harvest the cells, and then, the cells were resuspended in anaerobic fermentation medium to an OD600 of around 15. Anaerobic culture was performed in 50-mL anaerobic bottles containing 20 mL of the cell suspension, and the headspace was filled with CO2 to achieve anaerobic fermentation conditions. The anaerobic culture was performed at 220 rpm and 37 °C for 72 h.
For the experiments carried out in 1.5-L bioreactor, the seed culture was prepared by transferring of 1 mL of MLB/pTrc99a-pck glycerol stock to 30 mL of LB medium in a 250-mL flask, which was then aerobically incubated at 37 °C and 220 rpm for 8 h. All the seed culture was inoculated into 1.5-L bioreactor containing 1 L of medium. The fed-batch fermentation was carried out at 37 °C. In the aerobic stage, the pH was controlled automatically at 7.0 by addition of 1-M H2SO4 or 2-M NaOH. At the beginning of aerobic stage, the aeration rate was kept at 1 L/min and the agitation speed was 300 rpm. During the aerobic stage of fermentation, the dissolved oxygen (DO) was maintained above 10% by changing the agitation speed until the agitation reached 900 rpm. 0.5-mM IPTG was added into the medium to induce the overexpression of pck when the DCW reached 4–6-g DCW/L. The induction stage lasted for 4 h and the aeration rate maintained at 1.5 L/min. The anaerobic condition was established by stopping aeration and flushing the headspace for 5–8 min with CO2 from a gas cylinder to replace air. Then, the gas exit was close, and a gas bag full of CO2 was connected to the headspace to keep anaerobic condition and provided part of CO2 for succinate production. The agitation speed was maintained at 300 rpm at the anaerobic stage. At the beginning of anaerobic stage, 20 g/L of basic magnesium carbonate was added to provide part of CO2 and adjusted pH. During the anaerobic stage, the additional basic magnesium carbonate was added to maintain the pH above 6.3. Activated carbon was used to adsorb the harmful components in crude glycerol, and it was added into crude glycerol with the ratio of 3% (W/V). The temperature for activated carbon adsorption was 80 °C, and this process of adsorption lasted for 0.5 h. Then, the mixture of activated carbon and crude glycerol was centrifuged at 8000 rpm for 10 min. To reduce the viscosity of the crude glycerol, the supernatant was diluted by dd H2O with the volume ratio of 1:1, and then, the diluent was filtered through a 0.45-μm filter. The simply purified crude glycerol was stored into the refrigerator at 4 °C for further experiments. In the experiments of using the untreated rude glycerol, the untreated rude glycerol was also diluted by dd H2O with the volume ratio of 1:1 before adding into the culture media. The biomass was determined by measuring the optical density of culture sample with appropriate dilution at 600 nm (OD600). Dry cell weight (DCW, g/L) was calculated from optical density according to a relationship between OD600 and DCW. One unit of OD600 was equivalent to 0.333 g DCW/L. The concentration of glycerol, succinate, acetate, and ethanol was determined using a high-pressure liquid chromatograph system with a cation-exchange column (HPX-87H; Bio-Rad, USA) as mentioned before (Li et al. 2016, 2017b). To extract the free fatty acids (FFAs) from the crude glycerol and simply purified crude glycerol, a brief description of fatty acid extraction is provided below. Undecylenic acid was added as an internal standard in all the samples. 500 µL of 1-g/L undecylenic acid were added to 1-mL samples before extraction, and 1.5 mL of chloroform and 1.5-mL methanol containing 15% sulfuric acid were added. And then, the mixtures were incubated at 100 °C for 4 h for derivatization. To collect the derivatives, the mixtures were vortexed vigorously for 20 s and put it aside for 3 min and repeated the process three times, and then centrifuged for 5 min at 8000 rpm. The mixture in the tube would separate into two layers. The lower layer, CHCl3 layer, was recovered by pass through anhydrous sodium sulfate, and collect in a 13 × 100 mm test tube for GC analysis. The fatty acids in the crude glycerol and simply purified crude glycerol were quantified and analyzed by GC/FID (GC2014, Shimadzu Co., Japan) with a 30 m DB-5 column (30 m × 0.25 mm × 0.25μm, Agilent Co., Palo Alto, CA). Nitrogen was used as the carrier gas and the flow rate was set at 1 mL/min. The temperature of the column oven was set at 150 °C for 1 min, raised to 200 °C at a rate of 10 °C/min, held isotherm for 1 min, and raised with a gradient of 20 °C/min until the temperature reached 240 °C. This temperature was then held for 3 min. The injector and detector temperatures were both set at 280 °C. The chemical compositions of crude glycerol were dramatically different depending on the origin, the type of catalyst used in biodiesel production, the transesterification efficiency, other impurities in the feedstock, and whether the methanol and catalysts were recovered (Yang et al. 2012; Dobrowolski et al. 2016). Besides glycerol, the main ingredients of crude glycerol also include: 15–20% water, 5–7% salt, 0.5–2% organic compounds, and a very small amount of methanol and sodium hydroxide. The crude glycerol used in this study was the by-product of biodiesel and provided by Qianglin Bio-energy Material Co. Ltd., Liyang, Jiangsu, China. In this study, the contents of crude glycerol and simply purified crude glycerol were detected by HPLC and GC. The glycerol content in crude glycerol was 82%, and there were very few organic acids (only 1.84 g/L of acetic acid), but no methanol and other substances were detected (date not shown) by HPLC. The crude glycerol was simply purified by activated carbon, and then diluted and filtered. After treatment by activated carbon, the appearance of crude glycerol was changed from dark brown liquid (Fig. 1a) into colorless transparent liquid (Fig. 1b). Due to the dilution, the glycerol content in the stock solution of the simply purified one was decreased to 40.3% and the concentration of acetic acid was also dropped to 0.91 g/L (Fig. 1c), while nearly no other medium chain acids or alcohols were detected by GC (Fig. 1d). In our previous study, the engineered E. coli strain MLB with the overexpression of PCK was constructed, and the glycerol consumption and succinate production were enhanced significantly in the anaerobic stage of two-stage fermentation (Li et al. 2016). 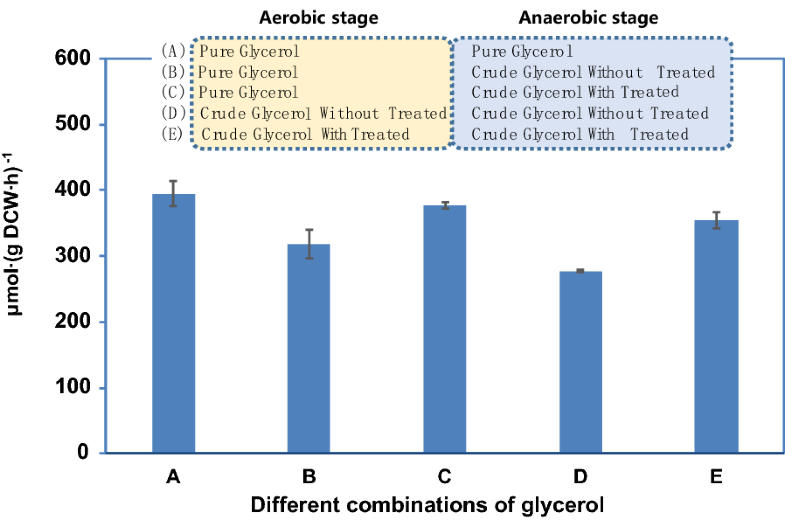 In addition, using acetate as the co-carbon source with glycerol under the aerobic condition could also increase the glycerol consumption and succinate production of MLB/pTrc99a-pck in the sequential anaerobic condition (Li et al. 2017a, b). Therefore, we assumed that MLB/pTrc99a-pck might utilize crude glycerol to produce succinate efficiently. In the flask experiments, the medium of GASM was used for cell growth at aerobic stage and IPTG was added to induce PCK overexpression. Then, the cells were harvested and transferred into the anaerobic fermentation. In the anaerobic fermentation, the crude glycerol, pure glycerol, or simply purified crude glycerol was investigated as the carbon sources for succinate production. The results of anaerobic fermentation are shown in Table 1. Compared with crude glycerol, when the simply purified crude glycerol was used as carbon source, glycerol consumption, succinate production, and succinate specific productivity increased by 17%, 20%, and 18%, respectively (Table 1). However, compared with pure glycerol, glycerol consumption and succinate titer had slightly decreased by about 6%, and the specific productivity and yield of succinate were basically the same (Table 1). The effects of different glycerol used as aerobic carbon source were also investigated. The medium containing pure glycerol, crude glycerol, or simply purified crude glycerol was named as GASM, CASM, and SASM, respectively. Then, the GASM-grown, CASM-grown, and SASM-grown cells were harvest and transferred into the nitrogen-free GASM, CASM, and SASM, respectively. The results are also shown in Table 1. Compared with crude glycerol, when the simply purified crude glycerol was used as carbon source in the whole two-stage, the glycerol consumption, succinate titer, and specific productivity were increased by 30%, 30%, and 28%, respectively. However, the glycerol consumption, succinate titer, and specific productivity were decreased by 10%, 10%, and 11%, compared with those of pure glycerol (Fig. 2). As shown in Table 1, we found that crude glycerol inhibited glycerol consumption and succinate production. The previous study has also shown that crude glycerol inhibits the production of succinate by E. coli (Sadhukhan et al. 2016). In this study, when the simply purified crude glycerol was used as carbon source, the inhibition of glycerol consumption and succinate production was significantly reduced compared with those using crude glycerol. Some unknown harmful components in crude glycerol might be partially adsorbed by the activated carbon. However, there might be still a few harmful components left in the simply purified crude glycerol, which had slightly affected glycerol consumption and succinate production. In the previous studies, to efficient utilization of the crude glycerol, it must be treated with a series of complicated steps, such as containing acidification, solvent extraction, activated carbon absorption, precipitation of the fatty acids with calcium, etc. (Manosak et al. 2011; Pott et al. 2014). While we only apply one of the steps, activated carbon absorption can reduce the inhibition of crude glycerol and improve the succinate production significantly. The above experiments carried out in flasks indicated that using simply purified crude glycerol as carbon source had little negative effect on anaerobic glycerol consumption and succinate production. To achieve higher concentration of succinate, two-stage fermentation was carried out in a 1.5-L bioreactor filled with 1 L of medium. Crude glycerol, simply purified crude glycerol, and pure glycerol were also used as carbon sources during the two-stage fermentation of B1, B2, and B3, respectively. About 10 g/L of acetate was added at the beginning of the aerobic stage as a co-carbon source of glycerol. A concentrated glycerol solution was added when the concentration of glycerol dropped below 50 mM. The profiles of glycerol, acetate, dry cell weight, and succinate concentrations are shown in Fig. 3, and the metabolic parameters were calculated for comparison (Table 2). The cell density was not measured in the anaerobic stage due to the insoluble basic magnesium carbonate addition in this stage. When crude glycerol was directly used as carbon source, the overall two-stage fermentation lasted 131 h, in which the anaerobic stage lasted 98 h. Under the aerobic growth stage, the untreated crude glycerol showed negative effect on cell growth, and the μmax was only 0.184/h, which were 9.3% and 12.8% lower than that of using the treated crude glycerol and pure glycerol, respectively (Table 2). During the anaerobic stage, the utilization of the untreated crude glycerol was inhibited dramatically and only 54.2 mM glycerol was consumed; the final succinate concentration was only 50.3 mM. The yields of succinate were 0.11 mol/mol in the whole two-stage fermentation and 0.93 mol/mol in the anaerobic stage (Table 2). The specific succinate productivity dropped sharply during the anaerobic stage (data not shown). However, succinate production was significantly improved when the simply purified crude glycerol was used as carbon source. The titer of succinate achieved 566.0 mM, which was 11.2 times that produced by the cells used crude glycerol as carbon source. The specific succinate productivity was also much higher than that of using untreated crude glycerol (Table 2). Compared with the pure glycerol, the specific succinate productivity and the specific glycerol consumption rate were decreased by 27% and 34%, respectively. However, the final succinate concentration of the simply purified crude glycerol condition dropped slightly to 91.9% of using the pure glycerol, which indicated that the residual impurities in the simply purified crude glycerol exhibited slight influence on succinate production. The yield of succinate changed little, somehow, even a little higher than that of using the pure glycerol. Similar finding was also reported by Zhou et al. (2014), which indicated that the yield of fumaric acid based on glycerol consumption was improved significantly on crude glycerol medium in comparison to pure glycerol. 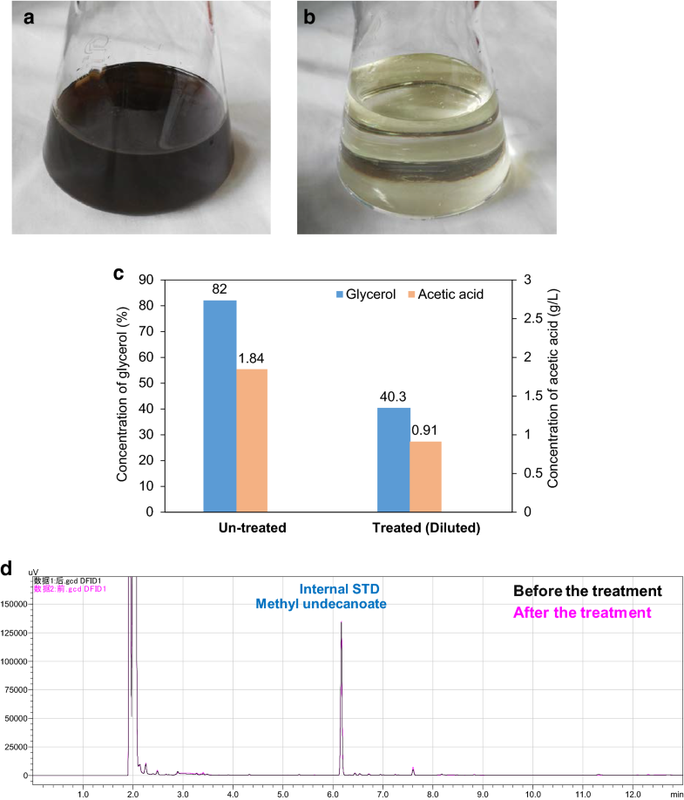 In addition, our results further indicated that the activated carbon absorption is a convenient and favourable way to reduce the inhibitory effect of the crude glycerol, and the engineered E. coli has good ability to utilize the simply purified crude glycerol for succinate production. In this study, crude glycerol was used as carbon source for succinate production by engineered E. coli. However, the MLB/pTrc99a-pck can hardly use crude glycerol directly in two-stage culture of 1.5-L bioreactor. The final concentration of succinate was only 50.3 mM. After simply purified of the crude glycerol by activated carbon, the concentration of succinate reached 566.0 mM which was closed to the fermentation result of pure glycerol (615.9 mM). Hence, treatment of crude glycerol by activated carbon could effectively release the inhibition on the glycerol consumption and succinate production of the engineered E. coli strains. HW and QY designed the experiments; QL and BH performed the research experiments; QH, JL, and XL helped in the experiments. ZL helped in manuscript preparation; QL, BH, HW, and QY analysis the data; QL, BH, and HW wrote the manuscript. All authors read and approved the final manuscript. We thank Shuigen Chen and Jianchun Jiang from Qianglin Bio-energy Material Co., Ltd. (Liyang, Jiangsu 213364, China) for kindly providing us the crude glycerol from the process of biodiesel production. This study was supported by the National Natural Science Foundation of China (Grant No. 21776083), the Fok Ying-Tong Education Foundation, China (Grant No. 161017), the National High Technology Research and Development Program of China (No. 2011AA02A203), and the National Key Research and Development Program of China (Grant No. 2017YFB0039302).